Carry-on 21": H:55cm x W:38cm x D:23m, Capacity 41L, Weight 2.5KG (approx.). Capacity: HUGE 60L, Weight: 1.95KG -. - Fits the Max 56x45x25 Easy Jet/British Airways and Jet 2 Cabin Approved Hand Luggage allowance. The retractable handle and spinning wheels will make your work, life and travel an absolute dream. Fashion and fun go together with Kipling products! Founded in 1987, Kipling, drew inspiration from Rudyard Kipling’s “The Jungle Book” and adopted the monkey as the Kipling icon because it is a symbol of adventure and youth. Size: 55x35x23cm (All Parts) - Cabin Approved for British Airways, Easyjet & Jet2! Capacity: 40 Litres. EASY MANEUVERABILITY WITH THE 4 MULTI-DIRECTIONAL CORNER (SPINNER) WHEELS. WEIGHT - 3.5 KG ONLY! Cabin Aproved With Most Air Lines. ORIGINAL AND AUTHENTIC. WEIGHT - 2.6 KG ONLY! EASY MANOEUVRABILITY. 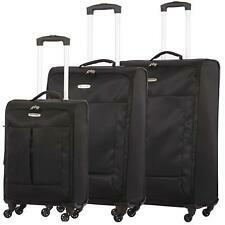 Montblanc Nightflight 4-Wheel Leather Trim Trolley Case. Superb Detail And Quality With Montblanc Emblem On Front. FREE Montblanc Gift Bag Also Available Upon Request. RRP: £1,295.00. Made Of Full-Grain Cowhide Leather. EASY MANEUVERABILITY WITH THE 4 MULTI-DIRECTIONAL CORNER (SPINNER) WHEELS. This wheeled laptop case is ideal for travel and can be used as hand luggage. A large padded pocket protects your laptop. The zippers are also lockable for extra security. 4 wheels & trolley handle allow for towing or pushing of the bag. Cabin Aproved With Most Air Lines. Darcey Cabin Sized Spinner by Kipling. This cabin-sized, cabin ready trolley is super easy to transport with four ready-to-roll wheels and a soft case for versatility. Fashion and fun go together with Kipling products! WEIGHT - 2.5 KG ONLY! EASY MANEUVERABILITY WITH THE 4 (SPINNER) WHEELS. COMBINATION PADLOCK INCLUDED. Northants Motorcycle Products : Moto Gp Cabin Trolley Bag. Complies with current airline carrier size restrictions on cabin baggage. Carry-on flight bag. Retractable trolley handle and wheels for easy pulling. Beautiful but practical Ted Baker 4 wheeled trolley case. Capacity is 31.5 Ltr. Height 55cm, Width 36cm, Depth 25cm. Accepted on most airlines as cabin bag. 4 wheele spinner. Cabin Aproved With Most Air Lines. WEIGHT - 2.6 KG ONLY! EASY MANOEUVRABILITY. The Darcey Spinner by Kipling. This trolley is super easy to transport with four ready-to-roll wheels and a soft case for versatility. Fashion and fun go together with Kipling products! Founded in 1987, Kipling, drew inspiration from Rudyard Kipling’s “The Jungle Book” and adopted the monkey as the Kipling icon because it is a symbol of adventure and youth. Kipling Darcey M Spinner. Colour: Soft Earthy C K1526180H. Fashion and fun go together with Kipling products! Founded in 1987, Kipling, drew inspiration from Rudyard Kipling’s “The Jungle Book” and adopted the monkey as the Kipling icon because it is a symbol of adventure and youth. Youri Spin 55 Spinner (Cabin Size) by Kipling. Increase the fun with the fabulously convenient Youri. 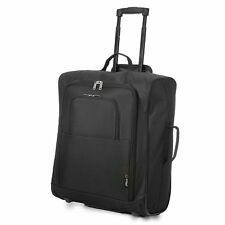 Kipling Youri Spin 55 Cabin Sized Spinner Trolley K11852H61 Black Leaf RRP £157. Fashion and fun go together with Kipling products! Made from durable polyester and complete with high quality rigid fittings. Light weight hand carry luggage bag, suitable for all airlines including budget airlines. Numbered lock supplied. Smooth 4 wheel spinner base. Youri Spin 55 SW Small Spinner (Cabin Size) by Kipling. Increase the fun with the fabulously convenient Youri. Kipling Youri Spin 55 Small Spinner Trolley K 1531660M, Colour: Small Flower. Fashion and fun go together with Kipling products! 4 strong wheels with 360degrees turn. Weights and Capacity Travel & Luggage. High quality soft case made from Nylon Polyester Material. Protective plastic coverings on all corners of the case. At Empire Trading we're always here to help! 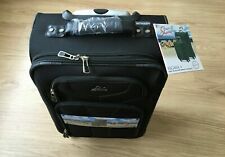 Wheeled Laptop Cabin Bag. Capacity : 40 L. One zipped pocket in the front. Travel in style with this super cool, Kipling Cyrah, large wheeled bag by your side. Kipling Cyrah L Spinner. Colour: Floral Night K14856T27 RRP £194. Fashion and fun go together with Kipling products! Kipling CYRAH S Spinner. Colour: Soft Feather K1486147Z. Its sleek design and cute Kipling monkey will make it the most easily recognisable, cabin size bag on the runway! Fashion and fun go together with Kipling products!